These simple warm cheese appetizers are wonderfully quick and easy to make. 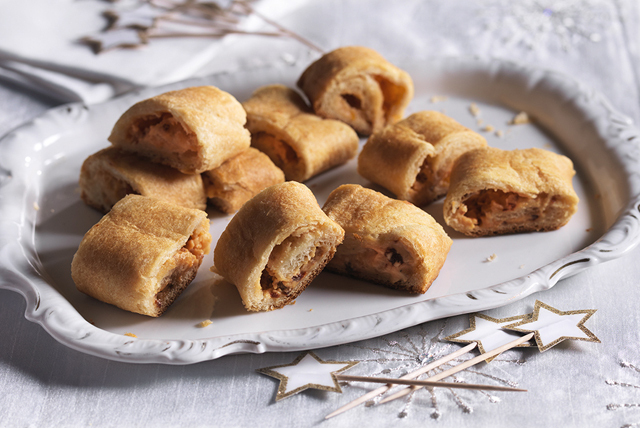 The unique combination of cream cheese, apricot jam and a small amount of chipotle peppers in adobo sauce all wrapped in flakey crescent dinner rolls is simply divine. Mix cream cheese, jam and peppers until blended. Unroll crescent dough onto cutting board; firmly press perforations together to form 12x4-inch rectangle. Cut lengthwise in half; spread with cream cheese mixture. Roll up, starting at one long side of each rectangle; pinch ends together to seal. Place, seam sides down and 2 inches apart, on baking sheet. Use serrated knife to cut slits, 1 inch apart, in tops of logs. Bake 15 to 17 min. or until golden brown. Cool 5 min. before transferring logs to cutting board. Cut each log into 12 pieces to serve. Chipotle peppers in adobo sauce can be found in the Mexican/Hispanic section of most grocery stores. They are usually sold in small cans. As you typically only use a small amount of the peppers in a recipe, save the remainder of the peppers and sauce for another use. Place remaining peppers and sauce in ice cube trays, adding about 1 pepper and small amount of sauce to each section. Freeze, then pop out into resealable plastic bag to freeze for future use. Place completely unwrapped portion of cream cheese in microwaveable bowl. Microwave on HIGH 15 sec. or just until softened.